Okay, okay… We know how much you love your Ministry Of Sound compilation albums – and we sure as hell know you love when we give them away to you! So in addition to Warner Music gracing our shelves with five copies of the Wynter Gordon album this week, the fine folk at Ministry Of Sound has furnished us with five copies of their latest red hot Running Trax compilation. This time around, the Ministry team has outdone themselves with not one, not two but THREE CDs full to the brim with club classics old and new that will assist you in staving off those dreaded winter chills. Check THIS POST for a full tracklist! But let’s just tease you with Wynter Gordon, Calvin Harris, Alex Gaudino, Dirty South, Shapeshifters, Afrojack, Tim Berg, Potbelleez, Underworld… See what we’re getting at? Good tracklist. To win a copy, you simply need to shoot us through an email containing your name and postal address to our spanking new email address (in the pink stripy square top right) with the subject line “You Got Me Running For This Prize” and we’ll whack you every so carefully into the draw. Competition closes at 11:59pm AET on Friday June 24, 2011. One entry per household. Winners (as always) are drawn entirely at random via our highly sought after raffle tickets/tub technique. 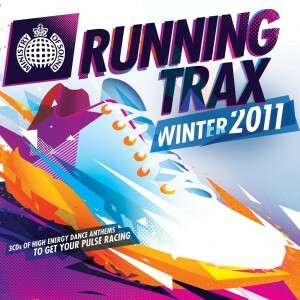 Five peeps will each receive a copy of the new Ministry Of Sound compilation ‘Running Trax : Winter 2011′ with thanks to the total spunks at Ministry Of Sound. Winners’ first names, towns/suburbs and states will be published on the site on Saturday June 25, 2011. None of your details will be passed on to anyone through this competition – your secrets are safe with us.